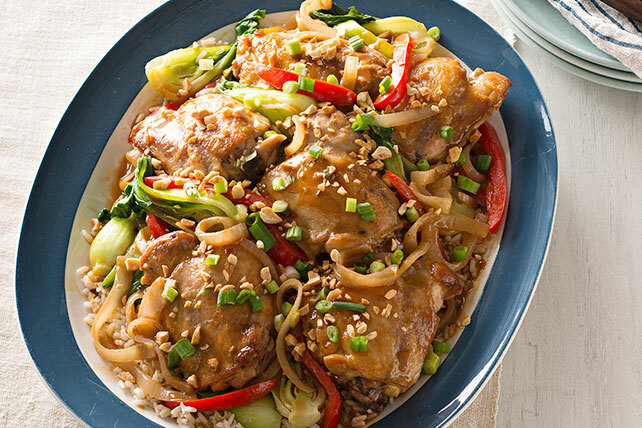 Try out something new with our Baked Asian Chicken Thighs. You'll be the star of the evening for serving tender and juicy Baked Asian Chicken Thighs . Combine first 4 ingredients; reserve for later use. Cook chicken in large ovenproof skillet sprayed with cooking spray on medium heat 5 min. or until evenly browned, turning after 3 min. Remove chicken from skillet; cover to keep warm. Add bok choy, yellow onions and peppers to skillet; cook on medium-high heat 3 min., stirring frequently. Stir in ginger; cook 30 sec. Return chicken to skillet. Add reserved dressing mixture; cover. Bake 25 min. or until chicken is done (165ºF). Serve over rice, topped with green onions and nuts. Substitute hot cooked lo mein noodles for the rice.